Acqua Plumbing’s expert plumbers can help solve any problem with your water lines. We understand that water lines are the lifeline to your home. A safe and reliable water supply isn’t something you want to risk. It is important to find a plumber that you trust to deal with your water lines. Acqua Plumbing has generations of experience going into every job they do. You can trust that Acqua Plumbers have dealt with similar situations before and can help you solve your water line problems. We can replace and repair water lines, applying the most efficient and cost effective solution that the situation demands. Plumbers rates can vary depending on what the job calls for Acqua can help you make the best decision based on the price in the short run and the long run. With Acqua you will find plumbers that are dedicated professionals and experts with water lines. Picture we have here is a recent customer of Acqua Plumbings'. 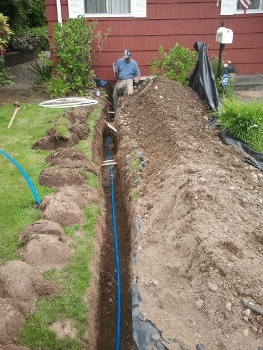 Acqua Plumbing installed a new water service line from the Water main to the home. The Piping is done in Warsbo Pex. The newer type of water pipe is very versatile and inexpensive. Acqua Plumbing tries to save money from our customers every chance we get. We always give the options in any plumbing services (such as the water line/ Water service main line shown) we offer. We worked diligently with our customers and even offer payment plans and options. Make an appointment with Acqua to find a plumber today!